Spiele Im Kopf: For starters, how about a few words about yourself and your background in Gaming? Garnek: I’ve been a gamer since late 80ties, I think. I started with the Polish edition of Talisman board game and some gamebooks, heavily inspired by the Fighting Fantasy series. I knew nothing about the original games, but I knew (from distant cousins living aboard) that out there in the West there were games we’ve never even dreamt of. A few years later I stumbled upon the first Polish magazine about role playing games, and bought my first RPG, a freshly printed copy of the Polish edition of WFRP. Immediately I knew that this was to be my hobby for the foreseeable future. As pen-and-paper role playing games are my hobby, my day job is designing video games. I worked on the story design for „The Witcher” series (I think the game was published in Germany as "der Hexer"), and now I produce more casual games for mobile devices. You can check out our newest game „Puzzle Craft” on iOS and Windows 8. I also teach game design on the Technical University in Lodz. So you can say that games are both my hobby and my occupation. In my free time, with my friends form Kuźnia Gier publishing I have the pleasure of developing „Wolsung: Steam Pulp Fantasy”. It is a role-playing game of cinematic action set in the daring times of magical technical revolution. And that is the game I would like to tell you more about. Spiele Im Kopf: Although Germany shares a border with Poland, we hardly know anything about the Polish RPG scene. Can you shed a little light on that and the role that both Wolsung and publisher Kuźnia Gier play in it? Garnek: This is how I see it: Polish market may be small, but there is a lot happening in there. We have a very active fandom, about five large conventions per year, and I think about a dozen local role playing games published over the last twenty years (not counting the Polish editions of foreign hits). At the moment we have three established publishers – Portal publishing with their post-apocalyptic hit „Neuroshima” and many board and card games, Gramel publishing Savage Worlds games, both in Poland and worldwide (check out „Beasts & Barbarians” and „Nemezis”), and Kuźnia Gier with Wolsung and many board and card games, such as „Alcatraz: the Scapegoat”, „1984: Animal Farm” or a collectible card game „Veto!”. There are also Polish editions of „WFRP”, „D&D”, „Call of Cthulhu”, „World of Darkness”, „L5R” etc. but not all of them are still supported by the publishers. There are also lots of English games, as they are easily accessible thanks to digital distribution. That is just a quick glance over the market, but it will give you the general idea. Spiele Im Kopf: What were the beginnings of Wolsung before it became a published product? Garnek: Oh, that is a looong story. It took us over eight years to finally publish Wolsung. We started as a home-brew game with our own rule-set (which BTW was horrible and I am glad it never got published – we had separate skills for sewing and shoemaking). Then for a few years we were running the game on conventions across Poland, using rules based on 7th Seas’ roll-and-keep or FATE. Then for some time we had an option of publishing Wolsung as a setting to d20 Modern, but the Polish translation of d20 got delayed by three years and then the system was abandoned by WotC in favour of DnD 4.ed. and Wolsung d20 was cancelled. Which was a great thing, because the rules were overcomplicated, heavy, and totally unsuited for the cinematic style we wanted Wolsung to be played. Finally we decided to publish the game by ourselves. After all these years of playtesting, experimenting with different rule-sets, and observing how players react to different ideas, we were confident that we knew what we expect from the game, and what we want to offer. Spiele Im Kopf: Why did you decide to create an entirely new RPG for the setting of Wolsung instead of just creating setting material - especially since you quote Savage Worlds as an influence, which would have been a good base for a conversion? Garnek: That is an excellent question, because our first idea was to publish Wolsung as a Savage Worlds setting. We designed the setting rules and antagonists in no time, and they worked fine. However, at the time there was no Polish edition of Savage Worlds and it seemed improbable that there will be one in a foreseeable future. So we decided to publish Wolsung as a stand-alone game with tailor-made rules. And so the game, although inspired by Savage Worlds to some extent, has its own strong and unique design points – cards that allow players to influence the narrative, conflict resolution engine that allows to play discussions and chases as vivid as combat scenes, gadgets that are part of your character, and the achievements system. Spiele Im Kopf: Speaking of Savage Worlds - there actually *is* a conversion of Wolsung for it out in Polish. German Savages have already noticed it and taken an interest - can we expect a translation anytime soon? Garnek: We were thinking about Wolsung in English from the very beginning, and were slowly working on the translation. On the other hands S2P is publishing Savage Worlds books and has business ties with our friends in Gramel, so they were easy to approach. Now, for starters we plan to translate and publish most of the Polish sourcebooks. As for the sourcebook on Wotany – we are thinking about that one for some time now, and we will really appreciate all ideas and insights from the German players. Seriously, if you have something in mind, that you would like to see in such a sourcebook, just drop us a hint. 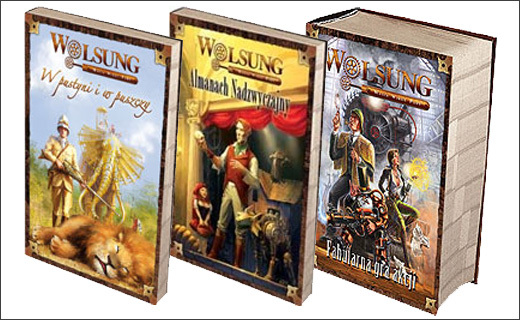 Spiele Im Kopf: To whet the appetite of your english speaking audience: Can you shed some light on the Wolsung RPG sourcebooks available in Poland, and possibly any future plans? Garnek: There is „Operation Wotan” which is an epic campaign featuring venrierites, zombies, trans ocean liners, mysteries from the past, and lots of ice. We have also published two sourcebooks giving more detailed info on the setting – „Lyonesse: City, Fog, Machine” focusing on the capital of Alfheim, and „Voyages Extraordinaire” dealing with non-Vanadian civilisations, the colonies, and lands yet unexplored by the Vanadians. There is also „The Almanac for Extraordinary Ladies and Gentlemen” which is sort of a players book, with some new rules and an extensive chapter on Vanadian politics. Currently we are working on a sourcebook on Slavia (our not-Poland). Spiele Im Kopf: Wolsung is not only an RPG - a Tabletop was released this year, and in 2008 there was also a board game. What were the motivations for branching into different game types, and have they met with success? Are there other types of games you'd like to apply the setting to? 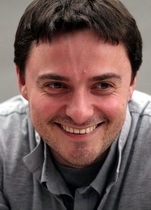 Garnek: We love the setting, so whenever there is a possibility to make a game set in that world, we try to do it. The Wolsung board game was a nice and simple family game, we produced while working on the RPG. And the Wolsung tabletop skirmish game is released by our friends from Micro Art Studio – they are taking care of the rules and the miniatures (which are fantastic! ), while we are taking care of the fluff and the setting. Spiele Im Kopf: From the rulebook I know that the titular Wolsung is a powerful wotanian company, but not that much more information is given. Why then of all possible titles for your game did you choose that one? Firstly, Vanadia is a kind of Europe, but the vanadian culture is based much more on nordic mythology (just like most of Europe draw from Greek and Roman myths) - and the Wolsung saga is a strong and interesting myth, with heroics, treason, cursed gold and a dragon. And as dragons played a crucial role in vanadian history, I thought it would be a nice idea to slightly hint at all that in the title. Secondly, Wolsung AG is a powerful company, personifying all of the most crucial changes of the Magical Industrial Revolution: the use of technomagic, the social changes caused by rapid industrialization etc. It is also a kind of cyberpunkish super-mulitinational-corporation, a perfect antagonist for those players who like to play out the "punk" in "steampunk". And last but not least, I think that a good name for a game should be short, should sound nice and be intriguing, and I hope "Wolsung" meets the criteria. Spiele Im Kopf: Thank you for your answers and taking the time. Any parting words to our readers? Garnek: Thank you for the interview and taking interest in our game. Ich hoffe, dieser ausführliche Einblick hat allen Unentschlossenen, denen Wolsung: Steam Pulp Fantasy bisher nur als ominöses Nischenprodukt eines unbekannten Verlags aufgefallen ist, dazu bewogen, mal einen genaueren Blick darauf zu werfen. Und um Garneks Anwort zur Frage nach zukünftigen übersetzten Produkten aufzugreifen: Was würde die deutsche Rollenspielgemeinde wohl gern in der vanadischen Version von Deutschland sehen? Kommentare wären mir, aber auch sicher Garnek sehr willkommen. Alle Grafiken in diesem Beitrag stammen von www.steampulpfantasy.com, www.wolsung.pl und http://www.wolsung-ssg.com/.